Valencia North Station, in Spanish “Estación del Norte“, was designed by Demetrio Ribes and built between 1906 and 1917. Valencia North Station is located next to Plaza de Toros (the Bullring) and a few meters from the Plaza del Ayuntamiento. The North Station is one of the most representative monuments of Valencia and is of civil modernist architecture. Its modernist design has influences of the Secession period: straight lines mixed with curved shapes. Its facade, in particular, is full of orange drawings, flowers, and other Valencian agriculture motives. In it there is a direct reference to the heraldic shield of Valencia, that represents the contrast between modernism and tradition; between rural and urban. 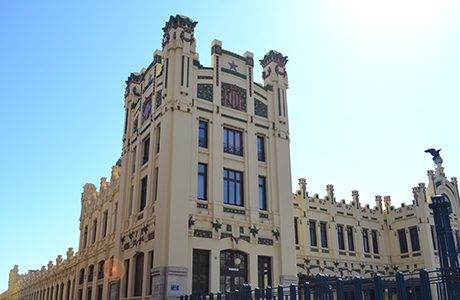 Valencia North Station consists of three towers, located on the sides and the center of the facade. In its final construction phases, the use of metal dignified the station as modern structure at the time. The station is still actively in use today and is one of the busiest train station in the country. From here you can connect to some of Europe’s major cities, giving it another reason for its categorization of main monuments Valencia.